In the last 7 years I’ve had the opportunity to review some seriously unique and interesting pieces for this website. Honestly though I think nothing has ever been quite as unique as what I have to share with you today. I’ve recently come into possession of a special Pre-Production Factor Sample of the S.H. Figuarts Hakaider Squad! While Kikaider & Hakaider related products may not necessarily be something of personal interest to each of you, this figure offers us a rare look at what goes into the process of creating a repaint and remold of a previous release. Yes, this figure is indeed a true blue working sample used to model new parts. At it’s base level it’s your standard Hakaider body. But after disassembly and study, you can see several areas where new parts from the final Hakaider Squad figures were integrated for testing purposes. The new biceps and face are dead giveaways. More than that though we also have the anti-theft paint job, as well as the trademark hole drilled through the figures’ chest that numerous Tamashii display samples have had through out the years. We’ve attached the full 40 image gallery of this unique item to this post, but please read through the in depth breakdown of what makes this factory sample what it is after the jump. Just click “Discuss on the TokuNation Forums” at the bottom of this post to be taken to the full thread. Timed perfectly with the Kikaider Reboot film, Ishinomori’s legendary hero will be making the HD jump into Bluray with a box set of the classic series having been recently been announced. The series will be split up into two Box Sets with the first being available May 9th for the whopping 24,000 yen(roughly 233 US before shipping) while the second set is due out July 11th for 32,500 yen. Of course, a the series will also be available in standard DVD format as well. Thanks to our friends at the Tokusatsu Network, we have translated details of the upcoming Kikaider movie, which many fans have been wondering about since it’s first “announcement” nearly a year ago. 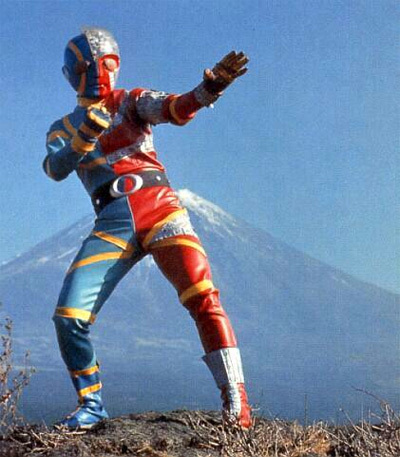 – Kikaider was created by Nobuhiko Komyoji as part of the ARK Project. After Komyoji mysteriously dies, Kikaider begins his fight against the ARK Project, which has now lost sight of its original purpose. Fans of the original series will be happy to know that the series’ original star, Ban Daisuke, is returning to the show as a character named Kyujiro, which when seen in Kanji, translates to “old Jiro”. Thanks again to the folks of the Tokusatsu Network for the translations! 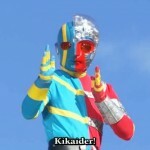 Are you excited for the return of Kikaider? Join in the discussion already in progress! 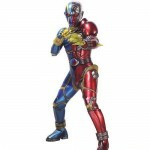 Android Kikaider Movie Reboot Designs Surface! After a long while of speculation, and nearly a year after it’s announcement at the end of Super Hero Taisen Z, the Kikaider movie reboot finally has something solid to show! 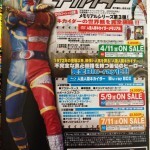 At long last the reboot design for Kikaider himself has been revealed! And a pleasant surprise accompanies this image, the reboot design for everybodies favorite anti-hero himself, Hakaider! That’s right, this image finally confirms that both androids will be featured in the film, though let speculation abound about Hakaider’s role. The film is said to be a heart warming love story. But as anyone whose seen Mechanical Violator Hakaider would know, love isn’t his forte. After teasing a new appearance in this summers’ “Superhero Taisen Z,” the legendary Ishinomori hero Kikaider is expected to return this fall! The exact details of the heroic cyborgs’ relaunch are yet to be confirmed so stay tuned to this page for further details! The end credits of Super Hero Taisen Z would reveal some surprising news: Shotaro Ishinomori’s Kikaider will be making a come back with a new revival project in the works. However, at the time of this posting it is currently unknown whether or not this project will be another anime adaption or live action. We’ll bring more news on this project as it becomes available. ISHIMORI PRODUCTION INC. & COMIXOLOGY ANNOUNCE DIGITAL DISTRIBUTION DEAL FOR THE CLASSIC MANGA LIBRARY OF LEGENDARY MANGA CREATOR SHOTARO ISHINOMORI AVAILABLE FOR THE FIRST TIME DIGITALLY Debuting three classic manga titles Cyborg 009, Kikaider, and Skull Man through Comixology. October 12th, 2012 – New York, NY – Earlier today during this year’s New York Comic Con 2012, Ishimori Production Inc. and Comixology – the revolutionary digital comics platform – announced a digital distribution deal for legendary manga creator Shotaro Ishimori’s entire catalog. To celebrate, Ishimori and Comixology will be debuting the widely influential Cyborg 009 , Kikaider and Skull Man across Comixology’s entire platform – including iPhone, iPad, Android, Kindle Fire, Windows 8 and the Web. Ishimori Production Inc. and Comixology worked closely together to acquire the highest resolution source material possible to present Ishimori’s classic manga creations in Comixology’s stunning high-definition comic format – CMX HD – for Comixology fans on the new iPad. With Guided View and CMX-HD, Comixology adds new excitement to these influential classic manga. 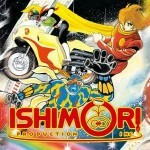 Ishimori Production Inc. maintain and develop intellectual property originally created by manga legend Shotaro Ishinomori whose works include Cyborg 009, Kamen Rider, Inazuman, Ganbare!! Robocon, Gorangers, Kikaider, Skull Man and more! Ishinomori’s works date back to 1954, and in 1964 he created Cyborg 009, Japan’s first super powered hero team. Recently Ishimori Production Inc. partnered with Archaia to create a modern adaptation of the classic Cyborg 009 manga series. Written by F.J. DeSanto and Bradley Cramp and illustrated by Marcus To, Archaia is set to release the graphic novel based on Ishinomori’s original creation early in 2013 and will also be available digitally through Comixology. Founded in 2007 with the mission of bringing comics to people everywhere, Comixology revolutionized the comic book and graphic novel world. With the development of the Comixology digital comics platform – with buy-once, read-anywhere availablility across iPhone, iPad, Android, Kindle Fire, Windows 8 and the Web – Comixology provides the easiest way worldwide for people to enjoy comics anywhere they happen to be! Regularly ranking as the top grossing iPad app in the entire iTunes App Store, Comixology is one of the leading drivers of the iPad economy. Providing the most digital comics on the most devices, Comixology will not stop until everyone on the face of the planet has been turned into a comic book fan.